So let's try this again, as I have been so busy over the last few months that I have seriously neglected a blog that I had barely started! I swear I'm utterly hopeless. So what's been happening since I last posted? Let's see, one mega holiday with my boyfriend and his family, then I managed to get job as a part time cleaner, and then the most amazing thing happened and I managed to get another part time job where my boyfriend was living and so I have since moved in with him and his parents until the new year where we are moving into our own place :) Like I said busy few months, and really really exciting! Considering I had resigned myself to just being jobless forever I am more than happy with where I'm at now. 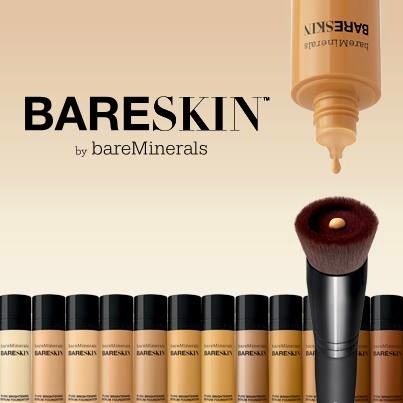 I have quite a few reviews that I have kept in the back of mind with the intention of posting so I'll start with a sample I tried of the new bareskin brightening serum foundation from bare minerals. Unfortunately this is not a happy review! I tried so hard to like this I really did, but unfortunately it just isn't for me. I have combination skin, my t zone gets pretty oily but I can also get dry patches on my cheeks and forehead. What can I say about this foundation? It's a light formula, I got bare linen which is a really good match for me ( when I first apply it! :( ) and it's easy to apply with a brush or with fingers which is always a plus. The bad, it clings to dry patches. It makes them so, so obvious it actually nearly brought me to tears a couple of times after seeing it in the mirror at work as honestly my skin is a daily struggle and this foundation was making it 10x worse! It's coverage isn't great, it provides some and helps even out blotchy bits but you definitely need concealer for what I'd consider minor spots. It oxidises, so whilst its a great match when I first put it on it gets darker after about an hour. Not good! I think it actually caused me to break out, but I do have quite touchy skin so this is always 50/50 with me! Conclusion? I wouldn't pay £26 for it. I don't think it's worth it, sorry! I gave it a good two weeks plus but I just couldn't get on with this one.